unPress is a responsive, minimalist, flexible and modern WordPress theme suitable for fashion magazines, newspapers or blogs. It was created to showcase your content in a clean, minimal, and fashionable space. With UnPress you can choose from unlimited colors, unlimited pages templates and many other options. Page Composer: You can create unlimited pages and category templates without any lines of code. Font Icons: 369 unique , scalable and vector icons comes with the Awesome Fonts. Scalable vector graphics means every icon looks awesome at any size. Custom Post Type: The theme can display many different types of content like Gallery, Video and Interviews. Like a really modern online magazine. Google Fonts: The theme comes with 600+ fonts from Google font library and default system fonts. Latest Interviews: Display latest interviews as slider or list. Video Thumbnails – Automatically retrieve video thumbnails for your posts and display them in your theme. Supports YouTube, Vimeo, Facebook, Vine, Justin.tv, Twitch, Dailymotion, Metacafe, VK, Blip, Google Drive, Funny or Die, CollegeHumor, MPORA, Wistia, Youku, and Rutube. Fonts used are Prata http://www.google.com/fonts/specimen/Prata and Helvetica Neue. The templates page are designed on 1280 grid system. 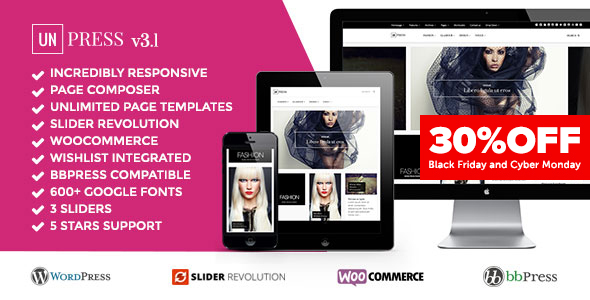 [NEW] Revolution Slider, with page composer it is easy to put slider on any page. [NEW] Full Width Flex Slider. [NEW] Full Width Elastic Slider. [NEW] Caption in gallery images.